Those things are not the whole of what there is to learn, of course, but I feel like they would go a long way to building a good foundation. 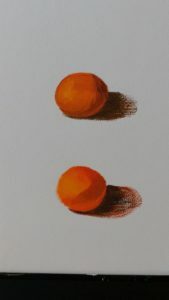 So…I happened to see this Sunday afternoon “leisure learning” course offered by UNB Saint John for beginner to intermediate painters…That sounds like me! In my usual manner, I proceeded to deliberate on this; how did I feel about giving up my Sunday afternoons for 6 weeks? What about the cost? Etc. I asked Cory and he said: If you want to do it, then go for it. So I did the online registration…Only to find out that the class was full. So much for that. Until I got an e-mail on Thursday saying a second class had been added to accommodate the wait list, and the next thing I knew I was all signed up…Didn’t even have time to really worry about it (in my usual manner…). So off I went today. We talked about colour, and paint, and colour some more. We mixed colours to make a colour wheel. 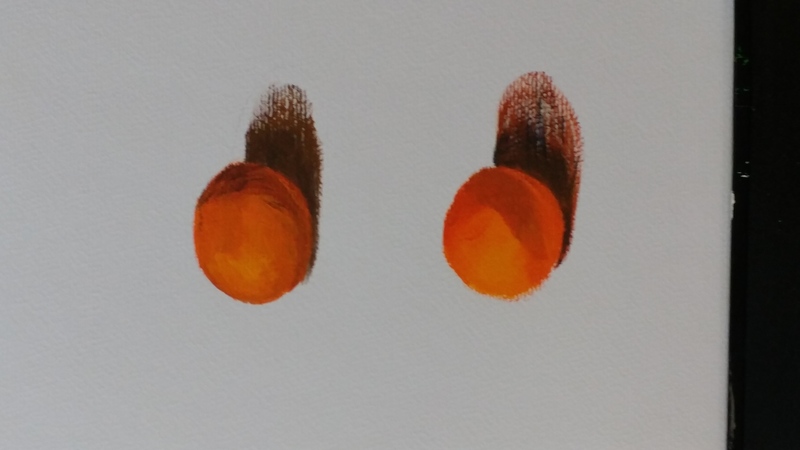 And then we painted clementines. So no exciting finished product today, but I was interested, I learned, and I had a lot of fun. I am looking forward to seeing what I can learn in the coming weeks and excited to [hopefully] improve my painting skills!